A fingerprint is comprised of a list of predefined structure fragments or feature found within a structure. Each feature that is present is represented as “on” by using the number 1 (as in one bit). NA represents the number of "on" features (bits) in structure A.
NB represents represents the number of "on" features (bits) in structure B.
NA&B represents the number of "on" features (bits) common to both fingerprints A and B. 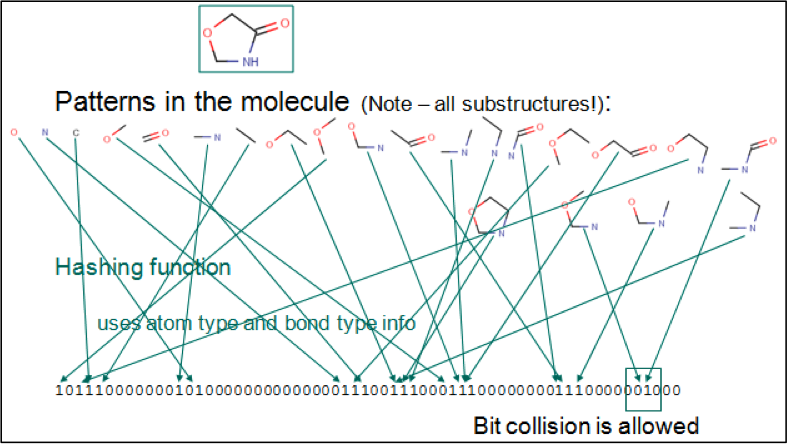 Up to a given bond, all linear paths (linear patterns) consisting of bonds and atoms of a structure are detected. All cycle (cyclic patterns) are detected. Using a proprietary hashing method, a given number of bits in the bit stream are set for each pattern. It is possible that the same bit is set by multiple patterns. This phenomenon is called bit collision. A few bit collisions in the fingerprint are tolerable, but too many may result in losing information in the fingerprint. Details presented within this documentation kindly provided by and reproduced from ChemAxon (www.chemaxon.com). For more information on general chemistry information, please see http://www.chemaxon.com/jchem/doc/user/query_searchtypes.html#full. For a more thorough explanation of the Tanimoto coefficient please see http://www.qsarworld.com/files/tamimoto_coefficient-1.pdf.